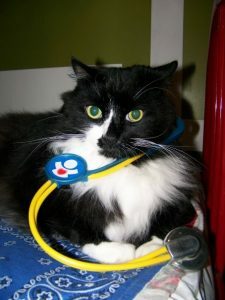 The great majority of feline respiratory diseases result from two easily transmitted infections, feline viral rhinotracheitis (FVR), caused by a herpes-virus, and feline calicivirus (FCV), pronounced (kah-LEE-see virus). FVR and FCV infections result in similar illnesses, characterized by nasal and ocular discharge, conjunctivitis, ulcers of the oral cavity, anorexia, depression and inflammation of the upper respiratory tract. Cats usually recover in one to two weeks, although cats with FVR can become persistently infected after returning to normal, shedding the virus during periods of stress. FVR can result in abortion of infected fetuses. Kittens are at greatest risk of FVR and FCV because they usually have had no prior vaccination or exposure and are highly susceptible to infection. Chlamydia psittaci (klah-MID-ee-ah SIT-ah-kye) bacteria are a less common cause of feline respiratory disease but can increase the severity of FVR or FCV infections. Vaccines are available for FVR, FCV and Chlamydia psittaci. Cats are wonderful companions. They give us joy, affection and unconditional love. IT’s no wonder we regard them as special members of our families. The least we can do is give them the care they need and deserve.